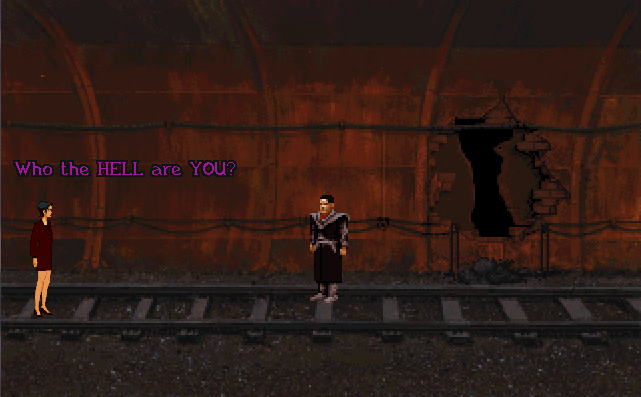 In the most elaborate Beneath a Steel Joke in Broken Sword II, Nico meets the protagonist from that game, Robert Foster, and tries to warn him about his gruesome death at the hands of a particularly nasty puzzle from that game. To access this puzzle, buy a piece of ancient chocolate in the abandoned Subway station, and then offer it to the ghost. Now, there is a path opened up on the far left side of the station (among the rubble) which will take you to the abandoned subway station from Beneath a Steel Sky.